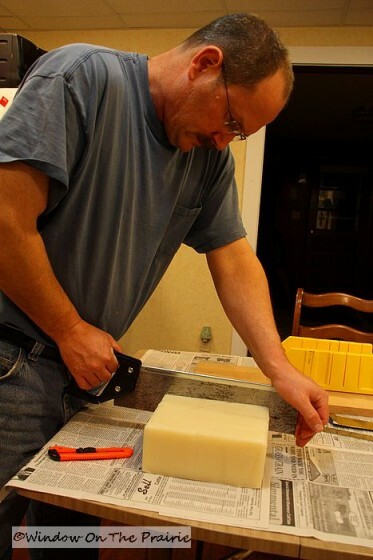 Yesterday, I showed how to make soap and then pour it in the mold. 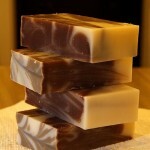 Today, it’s time to unmold the soap and cut it into bars. Here’s how is looks 24 hours after pouring. Getting it out of the mold is easy. Harland made this mold for me from plans you can find here. 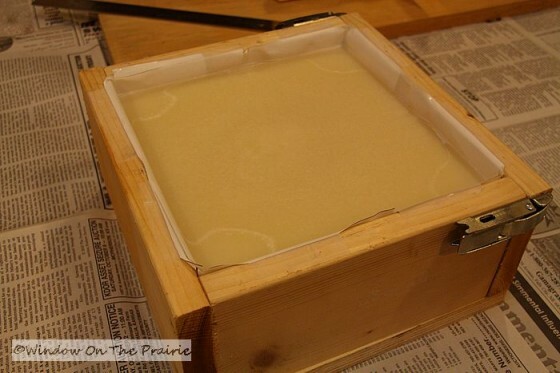 One of the sides is hinged, and once it is dropped open the soap easily slides out of the mold. 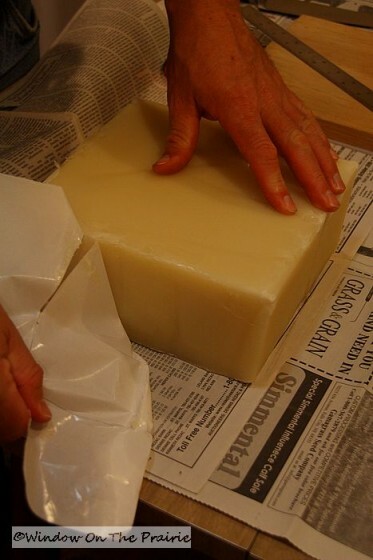 Then we removed the freezer paper liner, and were all ready to cut the soap. 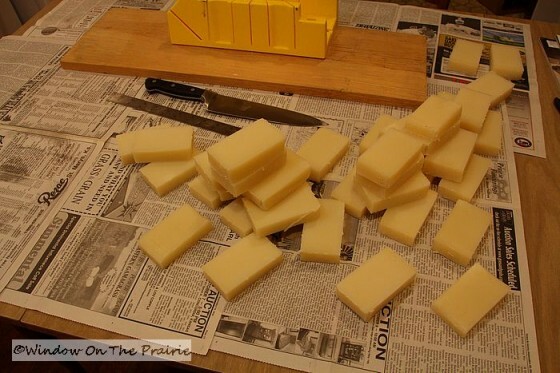 and cut into 1 inch pieces, or 7 bars of soap. 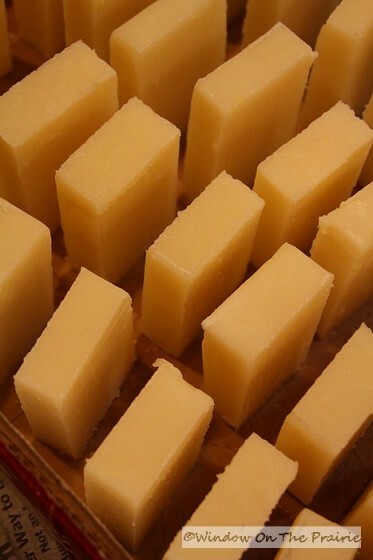 When all 4 sections are cut into bars, we have 28 bars of wonderfully unscented, yet clean smelling soap. We’ll allow it to cure for 1 month, and then use it for handwashing and bathing. 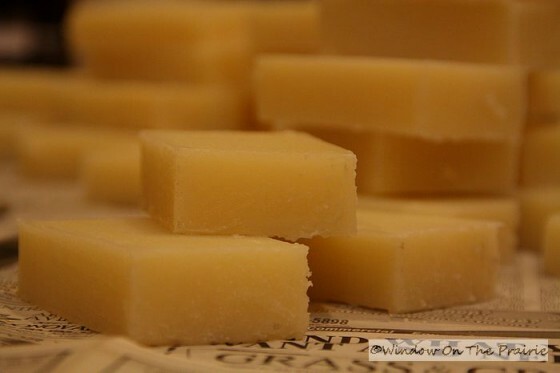 This soap does a great job of cleansing without drying out our skin, and is also very sudsy. Here’s a bar of soap that we made 1 year ago atop one of the new bars. 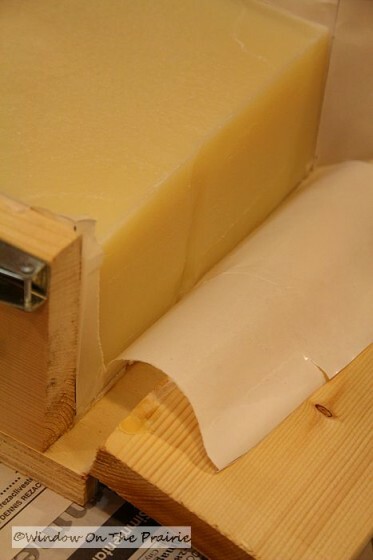 The darker color is due to the aging process. Pretty neat huh? 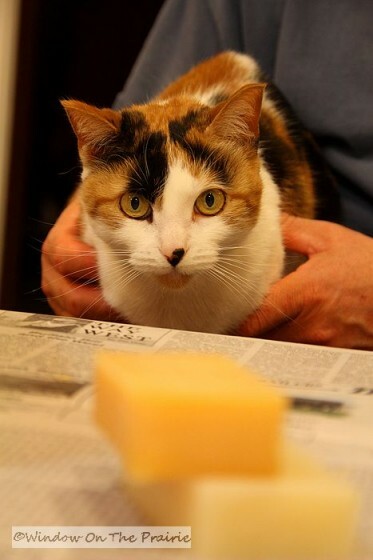 Oh, and no cats were harmed during the making of this soap. We promise. 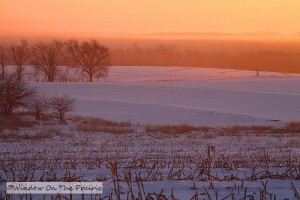 ——–> Later This Week: Winter sunrise. Love love Love your post! The soap looks super! I might try that this spring when I can get a few days of my own. By the way… I hope you all are ok and surviving the storm. Take care! Thanks for sharing how you make your soup. We sell the same drain cleaner with 100% lye at the hardware store I work at. I’ve sold that to women for the exact same thing! How much does a bar of soap actually cost you? Less than store bought? Probably better for you as well. Stay warm over there! Hugs! I ran the numbers one time, but I can’t remember the exact cost of the soap. I do remember though that it was less than store bought soap. I wish computers had some sort of smellvision so I could share the scent of the soap. Even though this recipe is unscented, it still has a clean soapy smell. Take care, and stay warm. Suzanne, how do you store your soap? 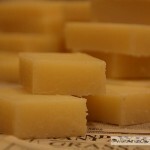 I’ve never made soap myself (just watched Mama back in the day), but I’ve gotten really hooked on goats milk soap. I might work up to trying this one of these days. I just stand them up in rows in an open box so air can get around them. 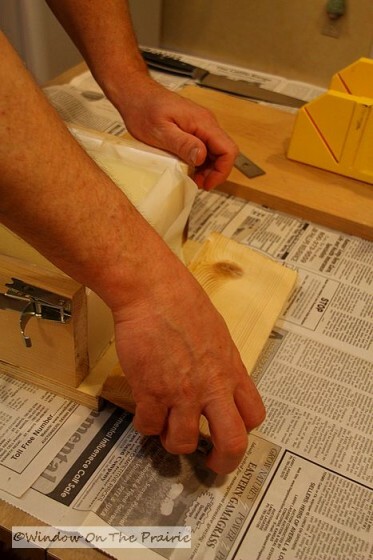 Give soapmaking a try, it’s so much fun! Enjoyed the blizzard videos! Glad you guys are doing ok up there. I grew up in Ky. although I now live in Fl…I remember rough winters…but not severe as yours. Was reading about your soap making. Looks like fun! I’ve used shower gel for so many years now with shey butter, I wonder if i would get the same skin softening effect as your homemade soap? 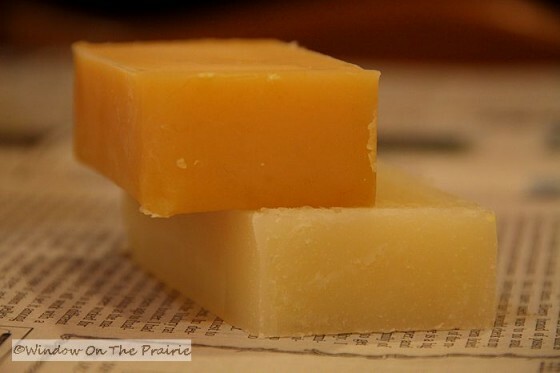 This recipe is a basic soap, but there are a lot of recipes out there for moisturizing soap. There are recipes that have milk, oatmeal and honey too. Loving it! I know I am going to do this for sure. My husband can build me that box too, he can build anything. The next time I go to Farm and Tractor supply I am going to pick up some lye. We have to go very soon too, because I just checked our chicken feed and we are almost scraping the bottom of the barrel! Thank you for the inspiration and the tutorial on the soap! 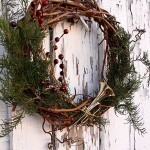 I love this as a project to do with my husband. 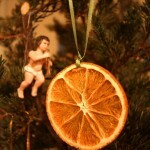 And the fact that it is homemade is truly appealing to me also. 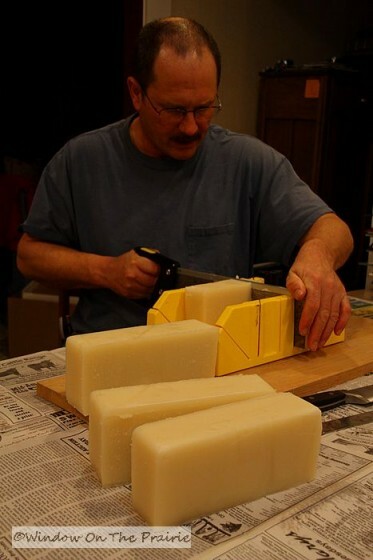 I remember making soap molds with my boys when they were young. We had a blast. We just melted clear unscented glycerin soap, added a scent and coloring and let sit in molds. They gave them to grandmothers and school teachers as gifts. I know it was cheating, but we had fun. Hello! Finally got back here to comment on your soap making. The bars look great. Love the soap mold box! 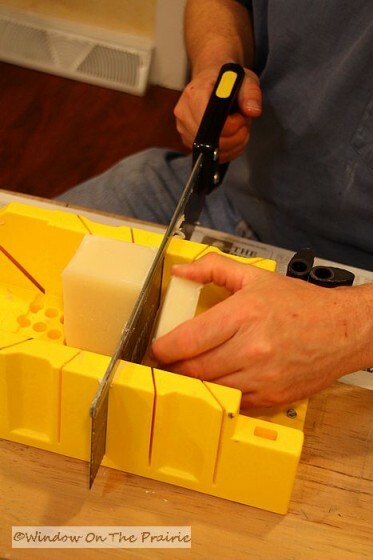 Using the miter box is a great idea too. 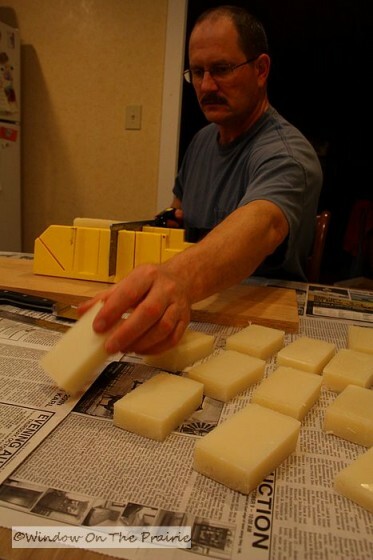 A friend of mine makes goat’s mild soap. It seems to be very moisturizing. 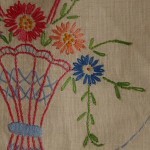 Isn’t it great to be able to make something useful for yourself. My mom used to make soap in big enamel pans outside. I remember be shooed away while she handled the lye. Her soap was kind of hard and dry. Dad used an old meat grinder to make it into little bits that my mom used as laundry detergent. She swore by it to get all the grease and stuff out of dad’s overalls. It was probably more crumbly because she used the tallow from butchering as the fat. P.S. All that snow you received will be so good for the garden and fields. Those big piles remind me of riding innertubes down piles my dad would make. Fun. Part of the reason people cringe when you say lye soap is that soap made back then was higher in content in lye, and harsher to the skin. Today’s recipes have less lye and are good even for sensitive skin. What a great lesson! 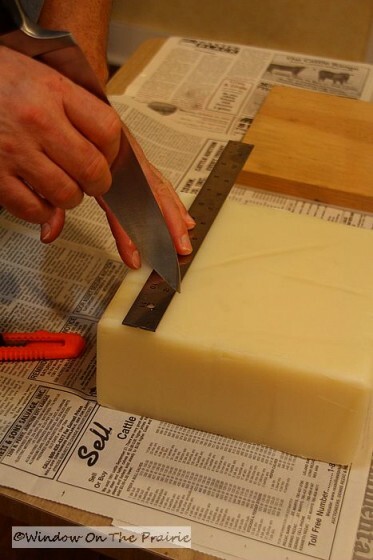 You made it look so easy, I’m definately going to try this, that is if I can get the hubby to make a box and cut the soap…….. Your lucky your honey is such a helper. I love your site, keep up the lessons!!! Do you have a recipe for making homemade toothpaste? 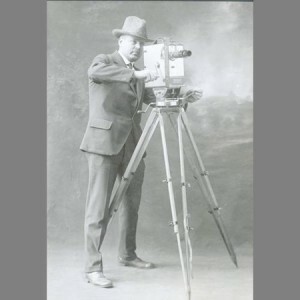 Enjoy your site very much. No, afraid not. But if you google it, I’m sure you’ll find lots of recipes. Is there a suitable fat that could replace the crisco in this recipe? Thank you so much for this awesome tutorial!